If you're anything like me, you love adding and changing pillows throughout your home. 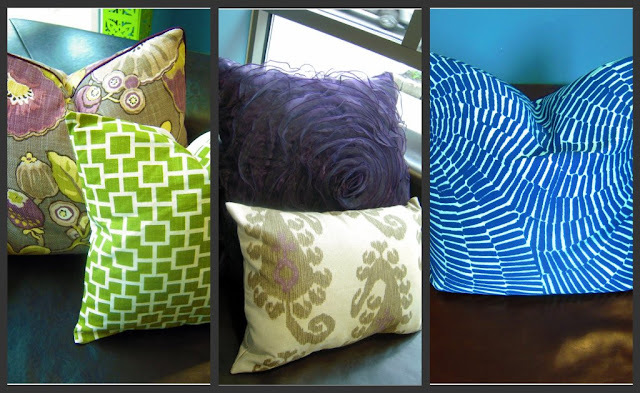 Pillows can instantly (and inexpensively) change not only the color scheme but also the overall style of a space. Katie Corrigan from Pop O' Color on Etsy has been the talent behind the beautiful pillows and cushions I've been incorporating in my design projects. She is a delight to work with and has been able to meet the many custom requests I've presented to her. Check out her shop for the many fabulous textile pillows she offers. Katie also creates custom window treatments and other soft furnishings including roman shades, drapes, cornices, valances, bedding, headboards, window benches, and table linens.